A professor at Drexel University says the only thing he wants for Christmas is the genocide of white people. 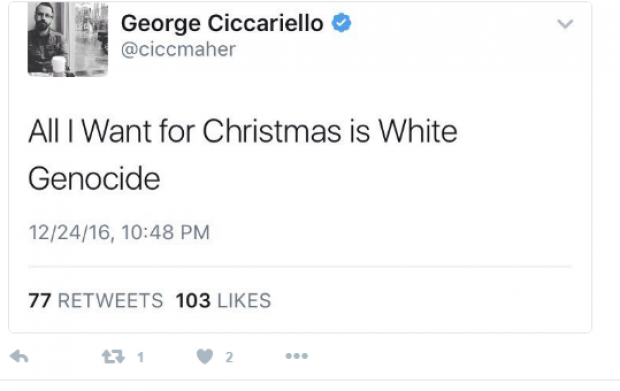 George Ciccariello-Maher is an associate professor of politics and global studies, and a self-described “radical political theorist.” In a Tweet posted late Christmas Eve, Ciccariello-Maher said his biggest wish for the holiday season is the genocide of white people. Ironically, Ciccariello himself appears to be white. 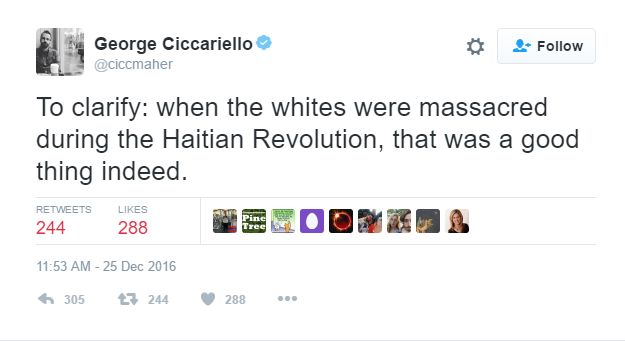 Lest anybody misunderstand him, Ciccariello-Maher followed up by saying it was a good thing when Haiti exterminated its white population. But elsewhere, Ciccariello-Maher attempted to argue that he wasn’t calling for racial genocide, because “white” isn’t actually a race. He also described white genocide as a “mythical figment” of the alt-right’s imagination, despite citing Haiti as an example of actual white genocide just a few hours before.